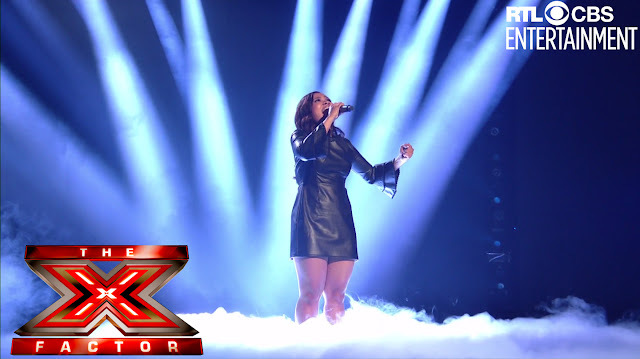 Twenty-two-year-old Alisah Bonaobra won UK’s heart and made it back to the live shows on The X Factor UK. Viewers were asked to vote for an eliminated act from the Judges’ House round whom they want to come back and compete in the live shows. On Sunday’s episode, it was a battle between the Boys and the Girls categories with the theme “Express Yourself.” The X Factor UK hopefuls performed a song of their choice related to the theme. While introducing her wildcard winner, Sharon Osbourne was very thankful to the public for bringing Alisah back. Alisah performed This is My Now by Jordin Sparks, which greatly impressed the judges and the audience. After her performance, the judges were on their feet and had nothing but compliments for her. “That song is absolutely perfect for you because this is your now and you deserve to be back on the show. You always should have been on the show!” said Louis Walsh. “It’s almost like a winner’s song, and I love a power ballad with a key change from a great singer and you are a great singer! You’re a great performer. You got great soul and I love the way you fight back!” he added. Nicole Scherzinger agreed with Louis and referred to Alisah as her little Disney warrior princess. “You just hiya-d and karate chopped all through that song! But you did it with grace. You did it with poise. You did it with strength. I freakin’ adore you!” she expressed. “I look at you and I’m like that’s my little ninja Filipina sister up there! You were meant to be up there, like [what Louis] said, this is your now, because that’s your stage, and you just took it tonight, honey!” she added. “Everybody says in this contest that they really want this, and they really need to be here. I know your story. I know what you’ve gone through. And you know what? With a voice like yours, you’re gonna be here ‘til the end, Miss! I am so happy for you, so, so happy!” said judge and Girls category mentor Sharon Osbourne. On the taped interview, Alisah called herself the “comeback queen.” She looked back at her journey where she was let go but asked to come back and fight for her spot at the Six Chair Challenge. Now she is back again as the wildcard winner. When host Dermot O’Leary asked the judges who they thought won the night, the lady judges Nicole Scherzinger and Sharon Osbourne both favored Alisah. Alisah survived week 1 of the live shows and will continue with her journey on the competition. Watch out for Alisah’s next performances on The X Factor UK on RTL CBS Entertainment. For more updates follow RTL CBS Entertainment on Facebook at www.facebook.com/RTLCBSEntertainment, @RTLCBSEntertainment on Instagram and @RTLCBSEntertain on Twitter. RTL CBS Entertainment is available on SKYcable channels 53(SD) and 196(HD), SKYdirect channel 35, Destiny Cable channel 53, and Cablelink channels 37(SD) and 313(HD).